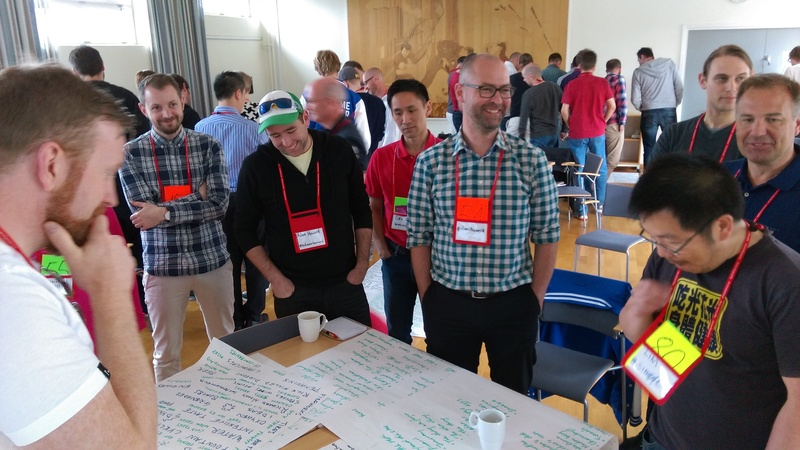 The first Swedish edition of SIGIST (Specialist Group in Software Testing) was held in Stockholm 23:rd of November. The organization has existed since 1989 and has previously organized conferences around the world, e.g. in the UK and in Israel. Have a look at their website if you are interested in learning more. The conference was run over a day and had five different speakers in the line-up. In between the speaker talks, there were short organized discussions called “corner talks”. Preselected topics were distributed to the four corners of the room. All conference participants walked to the corner with the topic they wanted to discuss and had a ten minute discussion of the topic. The takeways from each corner discussion were then presented to the other groups. I applaude this effort to involve all participants in the discussion, but I found it hard to get much value from the discussions due to the time constraints. I would suggest that next time, the subjects should be more specific. Maybe all corners should discuss the same specific question/problem and then the takeaways from each group could be compared. -Quality is context sensitive (e.g feelings for the product could differ between morning and afternoon the same day, depending on the mood). Pool-ball vs floorball metaphor. The requirements for a product are like a floorball, an empty shell with holes in it. Our mission is testers is to make sure that the product delivered is more like a pool-ball, e.g. a solid object without holes. Tres amigos approach can be useful, i.e. bringing testers, deveopers and requirements together to get a collective grip of quality. What to automate: test data preparation, enviroment configuration and test execution. Other testing activities needs a human brain. When testing complex systemst try to de-couple and test things seperately, integrate in the end. Earning your respect by finding valuable information (aka finding cool bugs). To find useful information: ask the customer what quality aspects/functional areas that he/she finds important. Use customers words when talking about and reporting later on. Even if something is not reportable since it is too vague(i.e. charisma bug), you can still talk about it at the coffee machine. Find out how often to report, how to report and what to report. Testing is not better than the quality of the reporting (loosely quoted). SFDIPOT mnemonic is great to generate test ideas and to reduce the risk to overlook some important area/aspect. Recycle and add to others´ models. Share your own for common understanding. -Test with real users in sprint. -More releases reduce risk due to fewer changes in each release. Since the next release is not far away you might also monitor in production, and fix next release. -When in doubt, whiteboard it to resolve ambiguities. -Rename defect or bugs to feedback or rework. Less negative wording has big impact on conversations and makes people less defensive. Some things are quick fixes, but some things take many years and iterations. Flexibility is key, everything does not need to go through the same test phases. Somethings can even be picked up in production if they fail. As a tester. attend some training in facillitating. Learn to gather a group of people at a witheboard and to extract information from them and then package that in a presetable format. One cool thing they had implemented was an automated process for problems found in production routed to the correct test manager enabled continuous learning and improvements. Testing is not test cases. Talk about performing test activities instead of test cases. There are many layers to testing that affect the performance, e.g. tester temprament, current role in project, test design etc. Tacit vs explicit knowledge is important to understand. The testing activity cannot be encoded, e.g. described fully in written language. Putting words on what you do is important, to make other understand and respect your work, but also to understand yourself. After James´ talk there was a panel discussion about the future of testing. The panel consisting of Rikard Edgren, James Bach and Andy Redwood agreed that testing 10 years from now will be roughly the same as today. James´ vision was that testing will have a higher status and that it will be a profession people will enter later on in their career, for example after having worked as a developer. An intersting local counterpoint to that idea is the specialized testing educations that we have in Sweden, which likely will draw in more young people in to the profession. The increased amount of testing services offered was also under discussion. The panel concluded that we will see more of that but that there are challenges in having parts of your testing outsourced, far from the development teams. The topic of artificiall intelligence was also covered, the belief here was that it will not have a big impact in the near future, but that we will see AI assisted testing in some areas (e.g. test design suggestions). 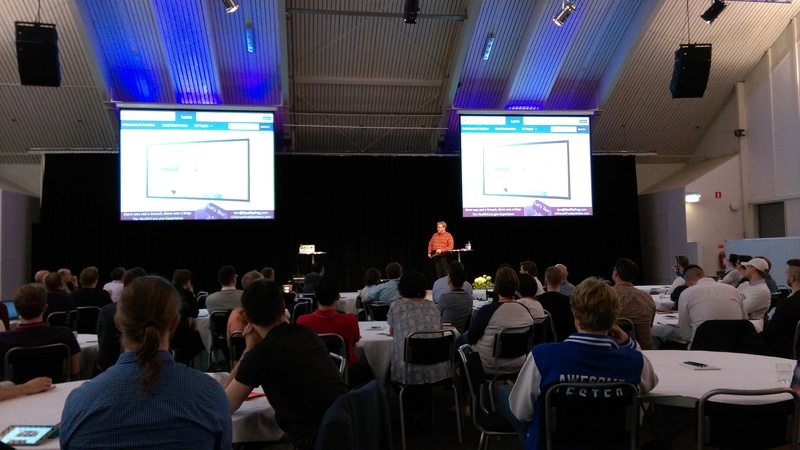 To summarize, I really enjoyed this first edition of SIGIST Sweden and I would gladly attend the conference again in the future. The low price combined with the one day format makes provides high value to a low cost. Hats off to the organizers for all the work they put in! 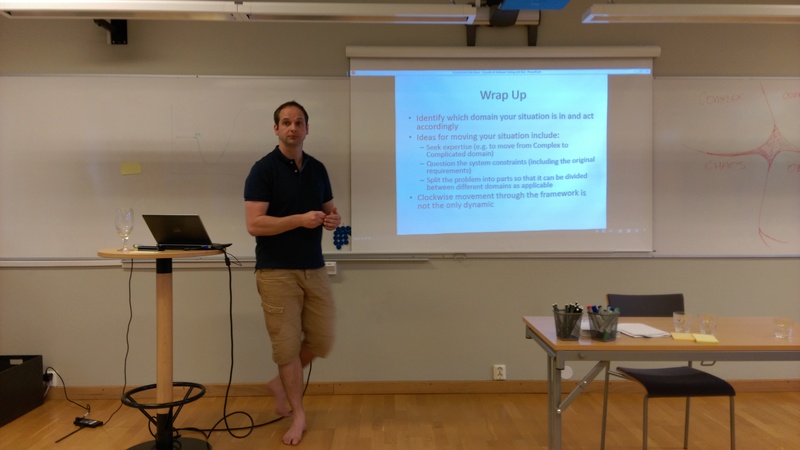 So I recently attended a brilliant workshop on the Cynefin framework at Let´s Test held by Duncan Nisbet. That workshop got me thinking about the control theory I studied at the university which I up until this day have never really used. But when starting to think about software development as a control theory problem I could connect the dots between an unstable control system and the Cynefin domain of chaos. Control theory is a collection of general theories about controlling systems. It could be a thermostat controlling the indoor temperature, making a Segway keep the balance, adjusting the flow of packets in a computer network etc. The main principle is showed in the picture below. So if we in our organization can acheive short time delays within our feedback loop (test often, test early), little noise (direct and clear communciation) and high observability (good testabillty) the chance of keeping the process stable and thus avoid drifting into chaos should be significantly bigger. No revolutionary ideas here, this is what generally is preached in software development and testing. But it is rather nice to see that we have support in our claims from the field of control theory. After two really intense days of Let´s Test it was time to get out of bed and muster up energy for the last day. The first session of the day was Baldvin Gislason Bern talking about his struggle to “Find purpuse in automation”. Baldvin is a former colleague of mine so I might be a bit biased but I thought he delivered a great presentation. The theme was revolving how he got assigned to different automation tasks in his organization and his struggle to understand why that automation was important, i.e. what purpose it served. I could not agree more about the importance to find out why to automate. All too often automation efforts seem to start with “we need to automate” instead of “how can we test better?”. 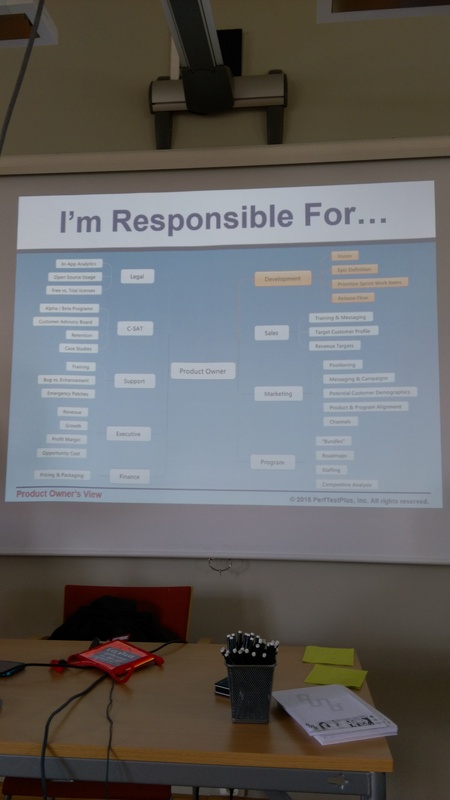 Baldvin also managed to provoke a little by bashing the test automation pyramid, the Agile movement and also by telling us about how he told his automation team to throw away 10% of their checks. These deliberate provokations sparked a great discussion after the presentation and it felt like everybody got something to think of from this session. What made me reevaluate my thoughts the most was the critique against the automation pyramid. I have always found it a useful model to apply for trying to “push tests down the stack”. I like the idea of having a few high level checks to find problems with how the different parts of the system interact, but to test the bigger set of variations on a lower level to reduce execution time, feedback loop and debugging. But I can agree with Baldvinds points that it cannot be applied in all contexts and that in some contexts comparing unit checks with higher level checks is apples and pears (my rephrasing). I guess it comes down to what checks you have control over in your context. If you work in a context where the development team is separate from the test team and the checks on different levels are divided between development and test, it is much harder to keep an overall strategy of how to distribute the checks. So I feel that the pyramid is valuable to illustrate an important principle, but that myself and many others might have been throwing it around too easily without providing the right context for it. I have often felt that it is really important to understand the roles of people around you in your organization. Having only worked as a tester I don´t have the luxury to have gained that knowledge by first hand experience. So that was why Scott Barbers session “Experiencing product owners” appealed to me a lot. Scott, known as the “performance tester guy” had recently worked as a product owner and wanted to share his experience from that. I was surprised of how much stuff the product owner is involved in besides prioritizing the backlog for the development team and communicating with customers. It seemed like he needed to be everywhere discussing revenue, packaging, support issues, marketing etc, etc. If the normal product owner role has only half of the responsibillites that Scott´s role had, it is still baffling that they have any time for the development team at all. The yellow part in the upper right corner is supporting development, the rest is other stuff. Now the end was near, only the final keynote before it was time to split up and go back to reality. 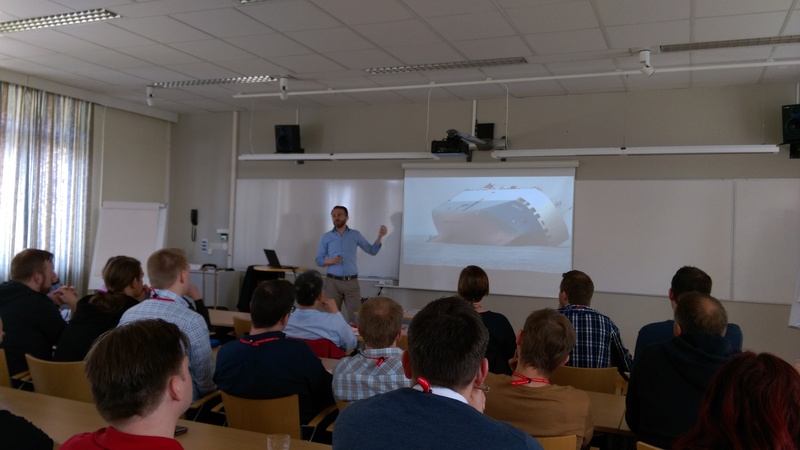 The keynote by Tumo Untinen told us the story about the finding and publishing the famous Heartbleed bug. It was interesting to hear about how it was exposed and how the release to the general public was handled. An interesting subject but I feel that keynote would have been better if some technical details had been left out. As always (I get to say that now since this was my second Let´s Test) it was sad that the conference was over. Unfortunately I had to leave immediately so no time for huging and goodbyes this time. Thank you all you awesome peers who enriched my conference experience, hope to see you next year if not sooner! 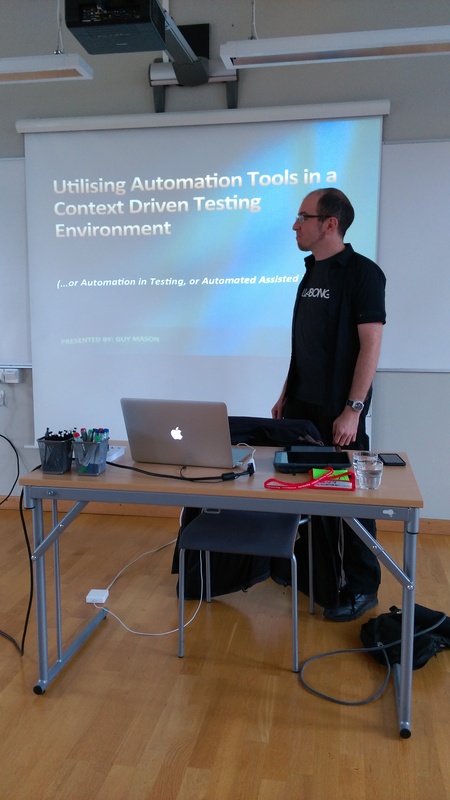 The second day of Let´s Test kicked off with an hour of “Utilising automation tools in a CDT environment” with Guy Mason. He talked about how automation is much more than regression checks and how it can be used to assist the testers in different ways. Some examples of these were: automation of work flows, data creation and performance testing. It is indeed an important aspect of automation that is often forgotten in the pursue of the ultimate regression test suite. I had thought about this topic myself a lot recently and Guys presentation helped strengthen my beliefs on this topic. 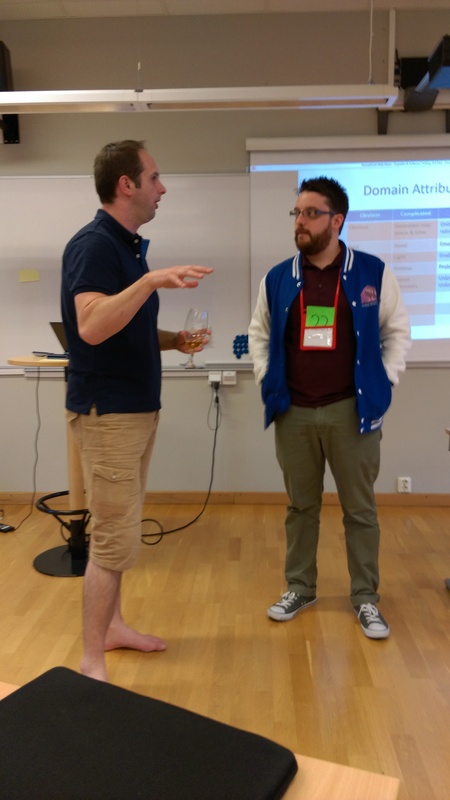 After the short morning session it was time for a full day workshop with Michael Bolton (@michaelbolton) and Laurent Bossavit (@Morendil) named “Defense against the dark arts”. Having quite recently read Laurents book about “Leprechauns in software engineering” I was looking forward to dig deeper into questioning various claims that gets thrown around a lot in our business. We continued by getting some pointers and tricks from Laurent and Michael on how to find potential problems with articles. For instance, searching for exact sentences that probably are quite unique might reveal other articles that are suspiciously related to the article under investigation. Also, I finding out that one of the main references is an unpublished master thesis doesn’t set off your smoke detector, I don´t know what will. Finally we got to choose a last exercise and I together with a peer tester decided to play around with the data suposedly supporting the claim that “Hurricanes with female names are deadlier”. The basic idea was that people are less scared of hurricanes with female names and would therefore be less cautious. It was fund to investigate a data set (we used Excel) in different ways to spot pontential problems. When we colored the cells for hurricanes with female names we found out that there was a period from the early 50´s to the late 70´s where all hurricane names where female (during other time periods it was roughly 50/50). The numbers of people dying from hurricanes where much higher than the total average and also much higher than the average of the “female hurricanes” from later years. This suggested that the death rate could be highly affected by the time era rather than the actual name. Investigating data sets like these is definitely something I would like to be more skilled at. Book pointers anyone? 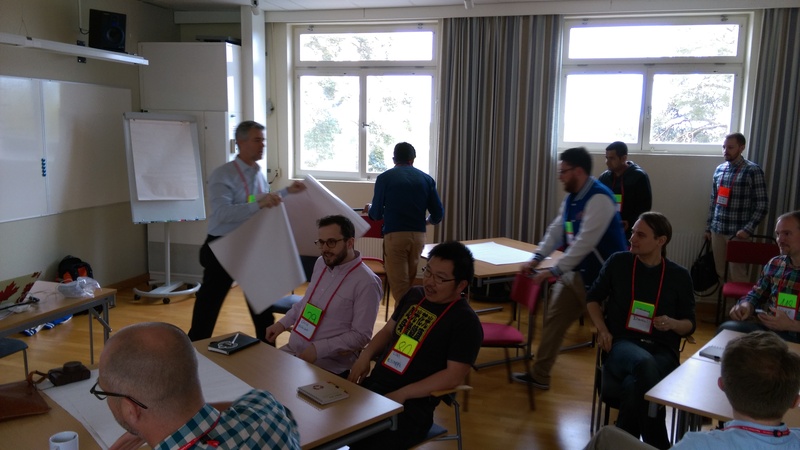 The main takeaway from the workshop was that the research field of software engineering is in bad shape and that we as professionals working in the field have a responsibillity to try to make things better (or at least not making them worse by throwing around folklore). It also helped me in striking a balance between being a critical thinker but still somewhat open minded to new input. For the evening session I joined Duncan Nisbet (@DuncNisbet) in “Cynefin sensemaking surgery”. I had recently tried to understand the Cynefin framework but felt that I was lacking examples on how it could be applied. Duncan had done some work on his own to as he put it “shoehorn software testing into Cynefin” (very successfully in my opinion). 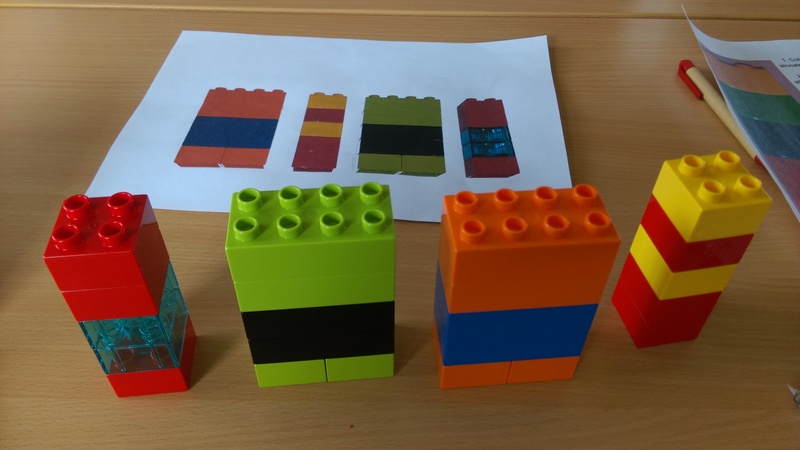 After a short introduction to Cynefin we got to put down different problems we had encountered on stickies and the placing the stickies in the appropriate domain of the framework. 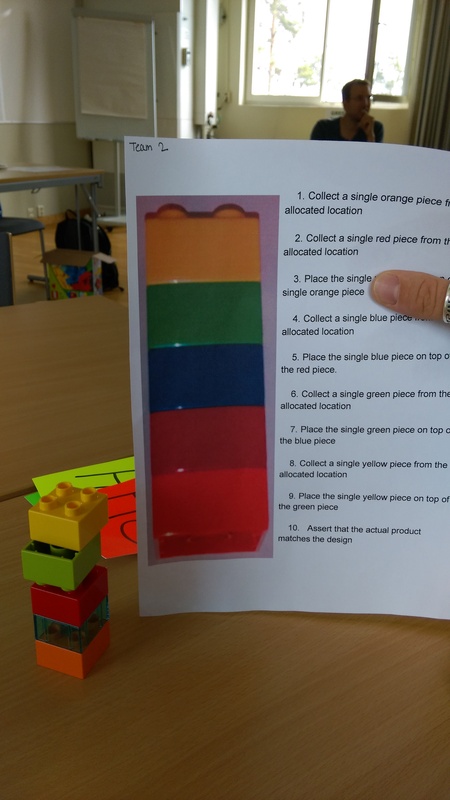 This was followed by group discussions where we were telling stories around our stickies and the group helped out on if the stickies were put in the right domain and how they could eventually be moved clockwise to a more ordered domain. These disussions were exactly what I needed to get a better grasp of Cynefin (which might feel very abstract when you first encounter it). I recommend that you check it out if you already haven´t, it is very useful to make sense of your complex and sometimes chaotic surroundings in a software project, or in life in general. The evening was rounded off in the test lab (a place I missed last year and had on my to-do list for this year). I paired up with another tester and we made some exploration of a new planning tool for complex projects. It was fun to make some hands-on testing and we managed to observe some important problems during our short session. The product feels far from ready in its current state but did show some promise for the future. It was a great thing though to test an actual product for someone appreciating our services. Bonus points awarded for having the developers of the product available on instant messaging. 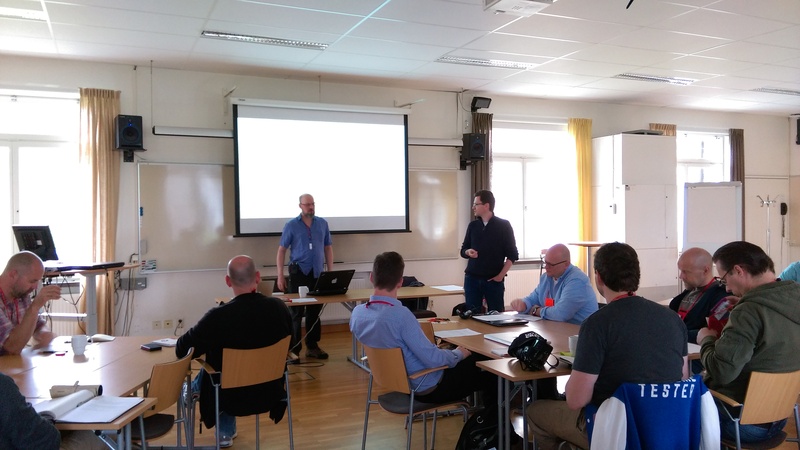 So it´s that time of the year when the Europe is hosting its big song contest and also its great test conferences: Let´s Test and Nordic Testing Days. I currently have the pleasure to attend the former for the second year in a row. I also decided to try to blog about it every day like I did last year. Partly due demand and partly because I like to summarize and write stuff down before I forget it. There is so much input during conferences like these so it will help me remember more of what I´ve learned and experienced. The extra spelling and grammar errors that comes with this way of working late in the evening will have to be considered a part of the authentic experience. 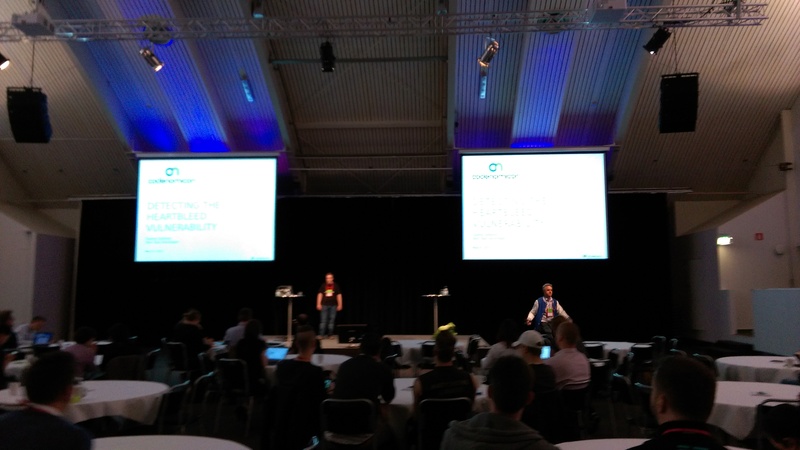 The first day of kicked off with the traditional AC/DC-intro followed by a brief introduction and then a keynote by Ben Simo (@QualityFrog). Ben talked about his experience investigation problems with the controversial healthcare.gov webpage and the attention it got both on social media and in traditional media. Although the start was a bit slow, the presentation really took off when he started discussion the problems he had encountered, and how the feedback was received. The whole keynote was a great reminder that we as testers can make a difference, even if all problems were not fixed in this case. Ben also listed a bunch of heuristics and mnemonics he used during his testing, including both the OWASP top security threats as well as ethical considerations. It really displayed the range of dimensions we as testers need to keep in mind while doing what we do. 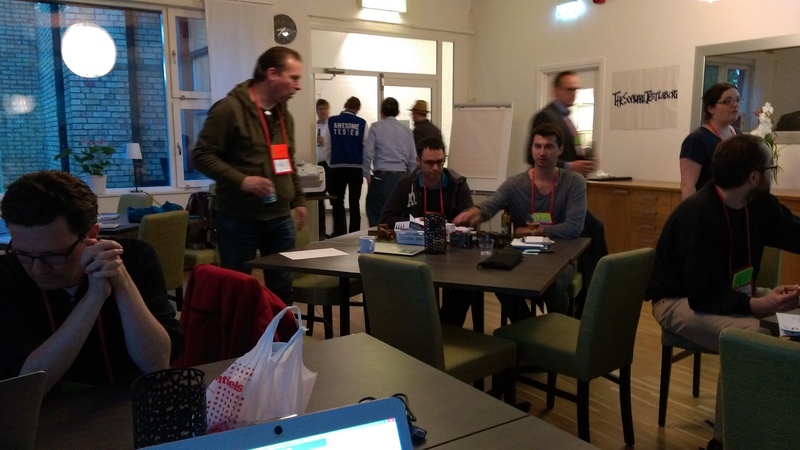 All in all a great workshop, if you are attending Nordic Testing Days, you should definitely check it out. After dinner it was time for yet another session, no time is wasted on Let´s test indeed. 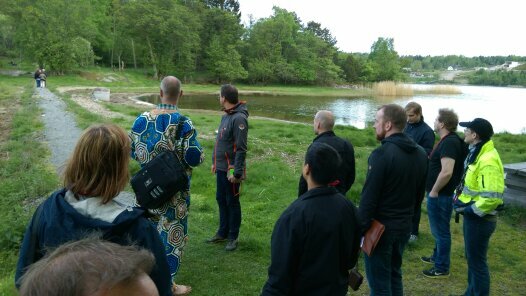 I attended ” A tester´s walk in the park” with Illari Henrik Aegerter (@ilarihenrik). I did not know what to expect but I thought that at least I would get some fresh air. 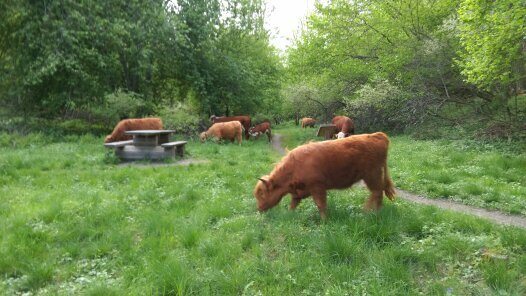 Inspired from the old greek philosophers peripatetic school of thinking the group took a walk in the park discussing different topics collected from the old “Tree of questions” (which turned out to be more of a bush really). To explore more or to return and report, that is the question. The format was really enjoyable and walking around disscussing definitely has its advantages such as: natural flow between different conversations and groups, more comfortable silences and easier to listen to what the person is actually saying since you don´t have to look them in the eyes all the time (the last one is especially true for introverts I would think). I really enjoyed this session due to its relaxed format. It felt like a natural part of the Let´s test experience with some additional setup that sparked interesting conversations. Bonus points for Illaris outfit and the beverage that was provided in the end for thirsty peripatetics. The evening ended with and some interesting discussions on schools of testing and exploratory testing. More of that tomorrow please.